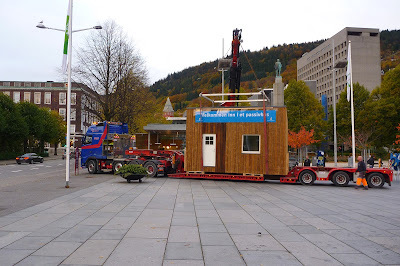 Earlier today, I passed while this installation was being removed from one of the public places in the centre of Bergen. It's a passive house (basically a very energy efficient kind of building) that has been exhibited for some time now, and a few weeks ago, I went with my friend Vegar, who is also an architecture student, to see it. There is a huge debate about passive houses in Norway these days, because, although they spend very little energy, they are also very high-tech, and the techo-optimists and the eco-architects do not agree as to whether the quality of air inside a passive house is good enough. This one is very small, but was fully equipped, and thus still interesting to see. However, the design was awful, with a door and the inside walls made out of a sort of cardboard (which can be really cool, but in this case was used for) imitating wood, and cheap, ugly moulding. Also, the air inside smelled of fart. Needless to say, we were not quite convinced, and I can't say I'll be missing it. To live in a "passive house" is hazardous to your health, because pumping air through metal tubes reduces the ionization of the air with 10 % for every meter! Today in Norway the ventilation mafia (the ventilation industry is a billion dollars industry) have tricked the governments to make a law for an exchange of indoor air exchange at 2,5 per hour. This is ridiculous! With healthy and moisture buffering materials, like in an active house (or permaculture house) you don't need more than an indoor air exchange than maximum 1, probably even not more than 0,5. 16)Suggested as therapy in chronic rhinitis, sinusitis, migraine, insomnia, tuberculosis, wound and burn healing, asthma, hay fever, emphysema, bronchitis, conjunctivitis, chlorine gas poisoning, preventing thromboembolism. In addition comes that natural ventilation has no fans and hence is completely free of noise. The monotonous noise of the fans is depressing no matter how low it is. On the contrary, the shivering of the leaves on a tree makes you happy, even the sound is lover than from a ventilation aggregate. So for me the choice between a "passive" and an active house is between Heaven or Hell. Not sure how I feel about passivhaus either. My lecturers are split too. It's cool to read about one in a first hand experience - thanks! I think that maybe an airtight house is maybe unsustainable, even though energy input is low, as there surely are a lot of plastics involved in its creation? Yes, it's completely sealed with plastic. I'm sceptical. Øyvind, why do you believe it's still allowed if it's so dangerous? Det er tillatt fordi byggenæringen ikke gidder å spille på lag med naturen, dvs. benytte fuktbuffrende og lavemitterende materialer etc som kan kompensere for mindre luftutskifte. De foretrekker mdf-plater, plast og glava istedenfor adobe, trefiberisolasjon og heltrepanel. De eneste tilfellene hvor det kan forsvares kunstig ventilasjon er der folk blir utsatt for tobakksrøyk, da dette er en enda verre ionedreper.